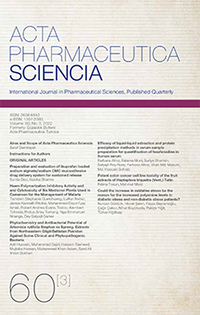 Aims and Scope of Acta Pharmaceutica Sciencia. Development and Validation of UPLC Method for the Determination of Olopatadine Hydrochloride in Polymeric Nanoparticles. Biosynthesis, Characterization and Cytotoxicity of Zinc Nanoparticles Using Panax ginseng Roots, Araliaceae. Enhanced Solubility and Drug Release of Ketoprofen Using Lyophilized Bovine Serum Albumin Solid Dispersion. Microbial Efficacy and Two Step Synthesis of Uridine Derivatives with Spectral Characterization. Dexketoprofen trometamol-loaded Eudragit® RL 100 nanoparticle formulation, characterization and release kinetics. Determination Amount of Silymarin and Pharmaceutical Products from Milk Thistle Waste Obtained from Cold Press. Antimicrobial Evaluation of Trisubstituted 2-piperazinyl Thiazoles.